Greetings from prematurely warm Michigan! Discussion in 'Introductions' started by dunkonu23, Apr 25, 2008. I'm Scott. I'm from Michigan, slightly north west of Detroit, in the sticks. I've been playing guitar a long time. I used to play in bands, but now, I just sit at home and play for my own enjoyment. I also record some things just for the fun of it. Guitars: EBMM JP6 BFR Bahama Blue Burst Quilt, 1981 Gibson Flying-V Heritage Reissue, 1984/5 Kramer Baretta and a 1985 Gibson Flying-V XPL. Amps: 1990 Mesa/Boogie Mark IVa, 1984 Marshall JCM 800 2204, and a 1996 5150 Combo. I don't use the Marshall anymore, it's in storage, so there's no temptation. I also have a Boss GT-8, and a Digitech RP2000. Not pictured is an additional Furman power conditioner. I've got a Hart electronic drum set and also a Korg Triton synth. Tascam FW1884, JBL LSR4328P Monitors, some mic's, some headphones all going into Sonar PE 7 with a lot of plug-ins. A Grendel Sound Dead Room for the amps. I'm into most rock, but really into Progressive music like Dream Theater, Opeth, etc. Greetings from 79* degree Chicago where it might snow again on Sunday night (LOL). Coming out to Royal Oak next week after visiting St. Joseph, and used to play at the Soup Kitchen, Rick's Cafe American, and Dooley's +:AOK all over Michigan. 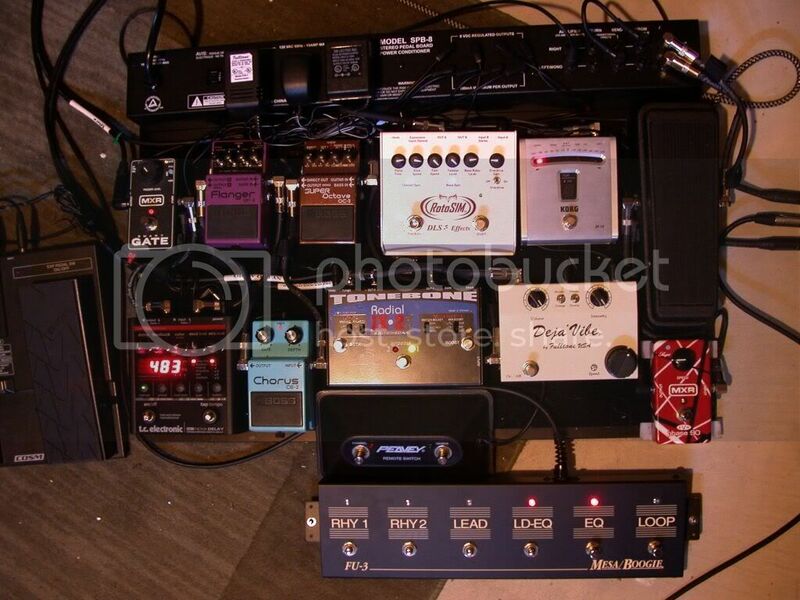 Nice lookin' board too bro. Thanks for welcoming me! It was really warm here yesterday, too. Today, it's back to about normal for this time of the year. Maybe some snow for tomorrow and Monday. Gotta love 50 degree temperature swings! Royal Oak's cool. We don't get out that way much since moving to the sticks, but it's all good. I guess Royal Oakist's don't get out this way much, either! Welcome Scott! I don't know about you but it's a snowing in Wisconsin today. Gotta love it! 90? I could live with that! I used to live in Northern Virginia... staggering differences in many way with temperature being the tip of the iceberg!